Fig. 1: Group photo on the ash altar at the beginning of the season, June 27. Fig. 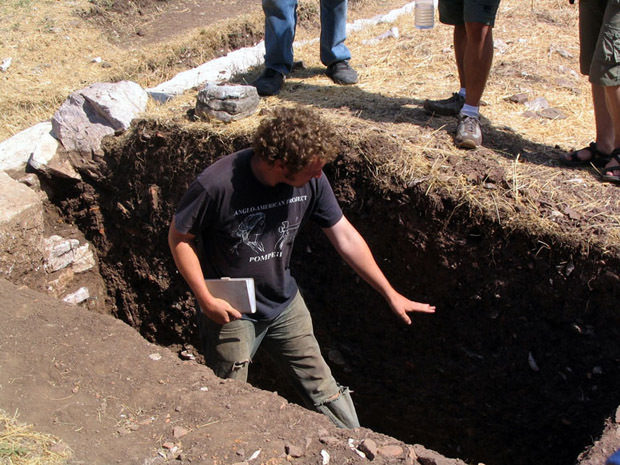 2: Apostolis Sarris and his team doing remote sensing below the hippodrome. Fig. 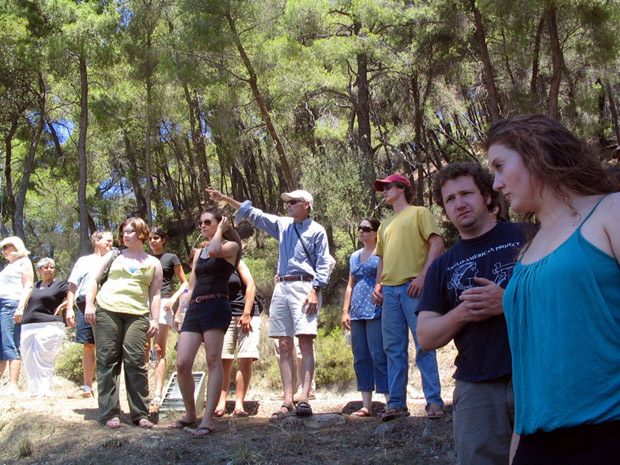 3: David Romano lecturing during a visit to the site of Olympia. Fig. 4: Andrew Insua operating the total station on a rise above the hippodrome. Fig. 5: Allisa Stoimenoff and Thanassis Christeas at work in the walnut grove (Trench F). Fig. 6: Anastasia Panagiotopoulou checking in with Christina Gieske and Maya Gupta in Trench H, inside the xenon. Fig. 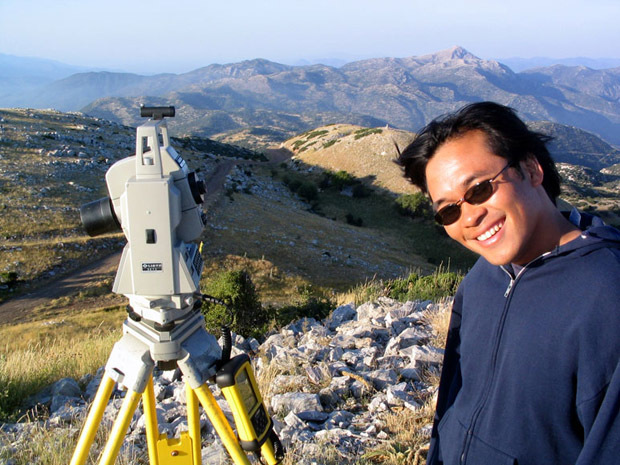 7: Arvey Basa with the total station on the ash altar. Fig. 8: Architects Margaret Jankowsky and Pam Jordan at work in the Cultural Center. Fig. 9: Reagan Ruedig drawing a block in the east wall of the xenon. Fig. 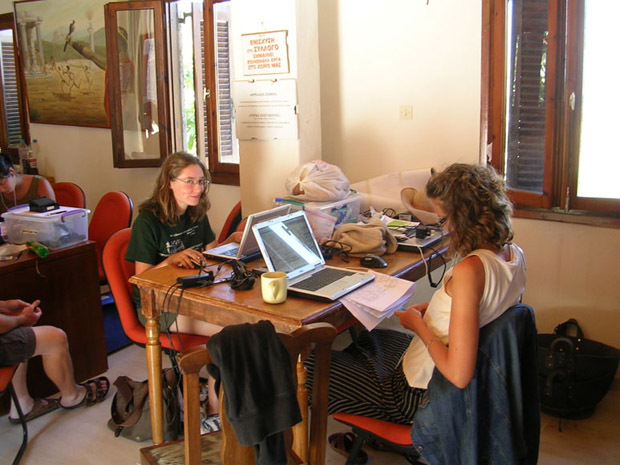 10: Emily Graff, Sarah Ward, Jared Benton, Allisa Stoimenoff, and Clivia Zois working on their notebooks in the plateia of Ano Karyes. Fig. 11: George Davis outside the dining palace in Ano Karyes. Fig. 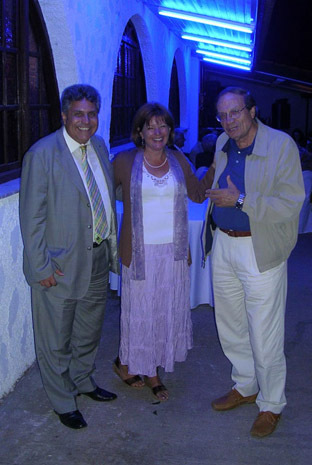 12: Mary Voyatzis with Christos Koumoundouros, president of the Syllogos of Ano Karyes, and Kyriakos Karagiannis, former president of the Syllogos of Ano Karyes. Fig. 13: Group photo in front of the dining palace, July 17. Fig. 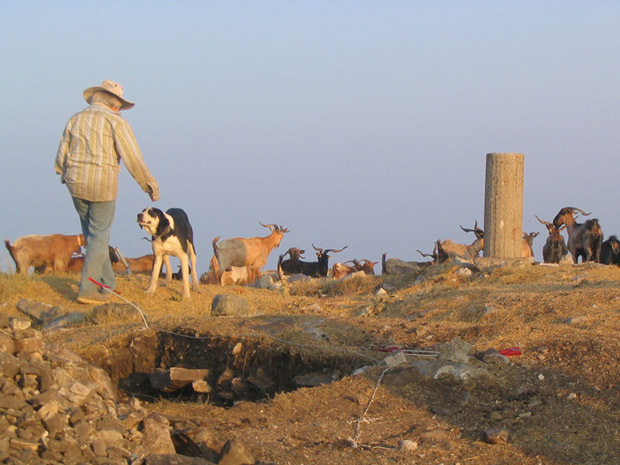 14: Ethne Barnes with friend as a herd of goats passes over the ash altar. Fig. 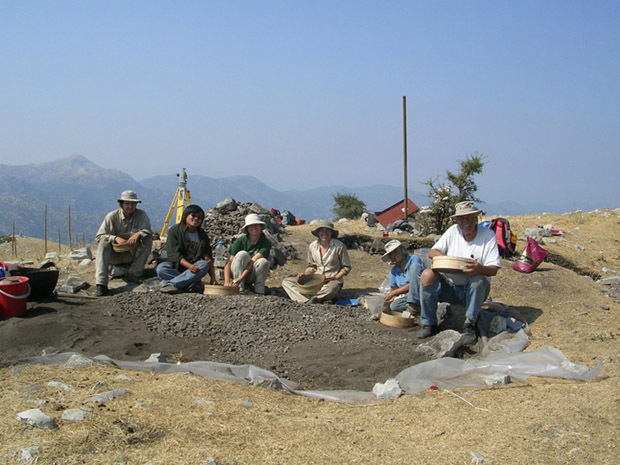 15: Team Zeus on the Ash Altar: L-R Dan Diffendale, Arvey Basa, Susan Mentzer, Alexis Belis, Ethne Barnes and Art Rohn. Fig. 16: Greek workmen Thanassis Christeas, Giannis Markolephas, Giorgos Aglamisis, and Ilias Aivalis taking a break on the steps in front of the stoa. Fig. 17: Jared Benton discussing stratigraphy in Trench G, below the steps. Fig. 18: Trench Tours! 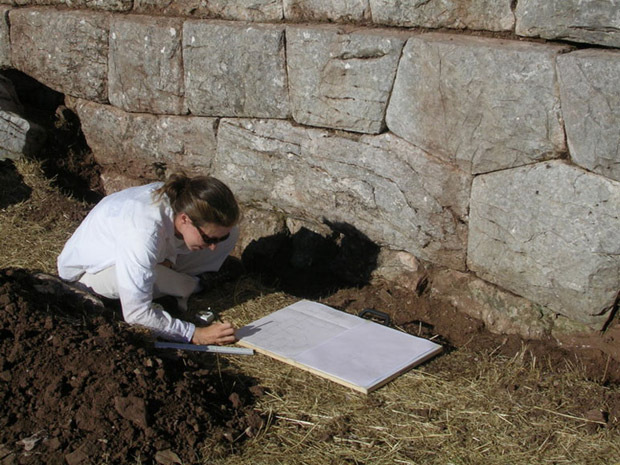 Sarah Ward and Emily Graff explain their work in Trench E.
Fig. 19: Architects Pam Jordan, Becky Hughes and Margaret Jankowsky showing their work on the xenon wall. Fig. 20: Tommy D toting a tray of tasty treats. Fig. 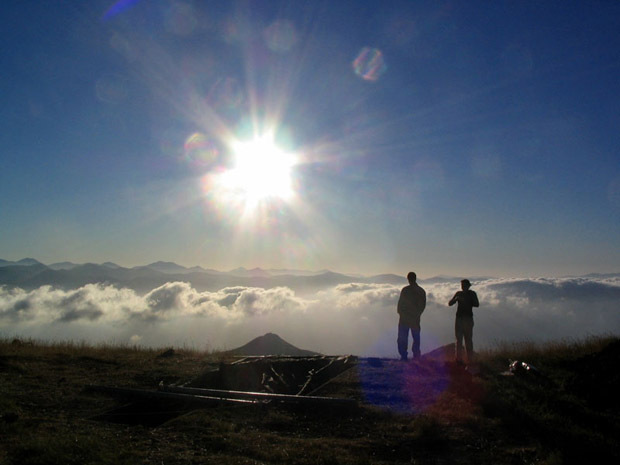 21: Josh Gieske and Alexis Belis watch the morning sun over the temenos and Trench Y. 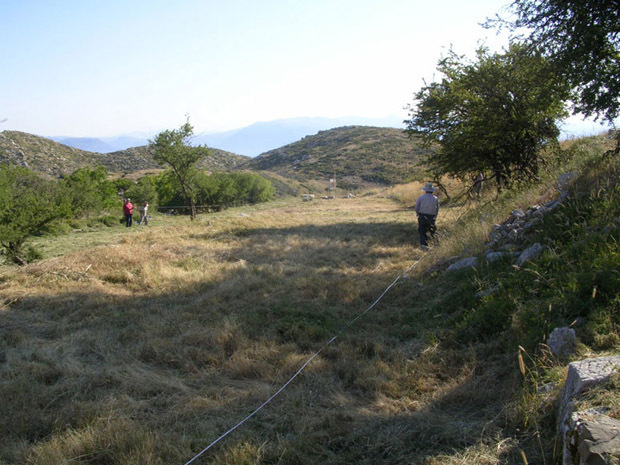 From June 26 through August 7 a group of researchers continued their investigations of the Sanctuary of Zeus at Mt. 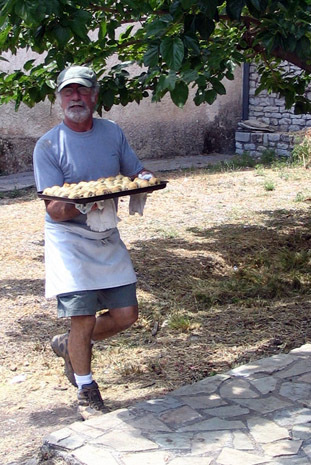 Lykaion, where work has been underway since 2004. 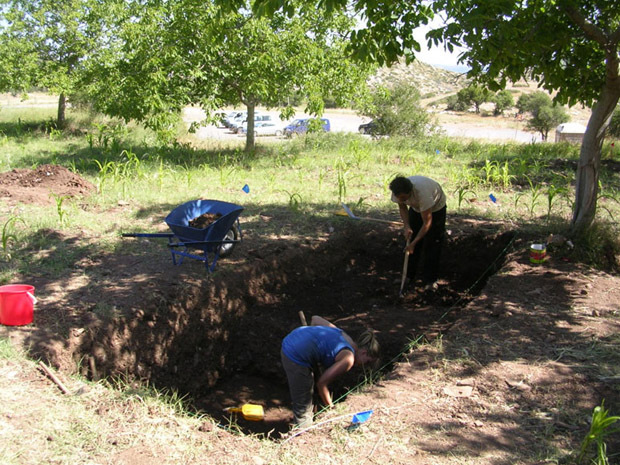 The team included specialists from the University of Pennsylvania Museum of Archaeology and Anthropology, together with a team from the University of Arizona and in collaboration with the 39th Ephorate of Prehistoric and Classical Antiquities in Tripolis, Dr. Michalis Petropoulos, Ephor. Our synergates is Anastasia Panagiotopoulou of the 5th Ephorate of Prehistoric and Classical Antiquities, Sparta. The excavation continues to be made possible through the support and generosity of individual, foundation and Greek-American support from the United States and is run under the auspices of the American School of Classical Studies at Athens. The financial support and generosity of Mr. and Mrs. Nicholas Karabots of Fort Washington, Pennsylvania continues to be of importance to the project. 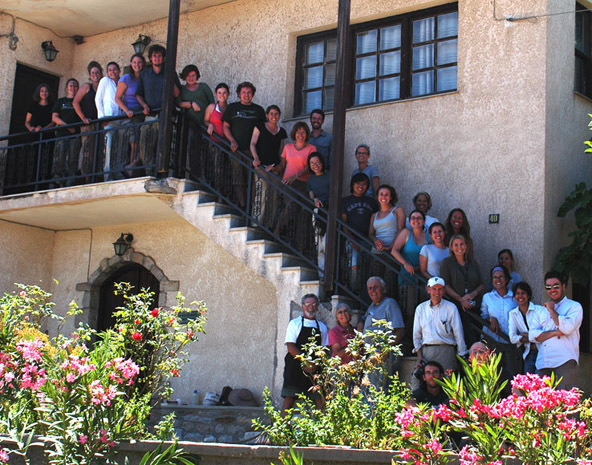 The team that numbered up to 47 students and staff stayed in village accommodations in Ano Karyes and in nearby Kastanochori. The project appreciates the cordial and helpful assistance offered to all members of the team by the Syllogos of Ano Karyes, Christos Koumoundouros, President. 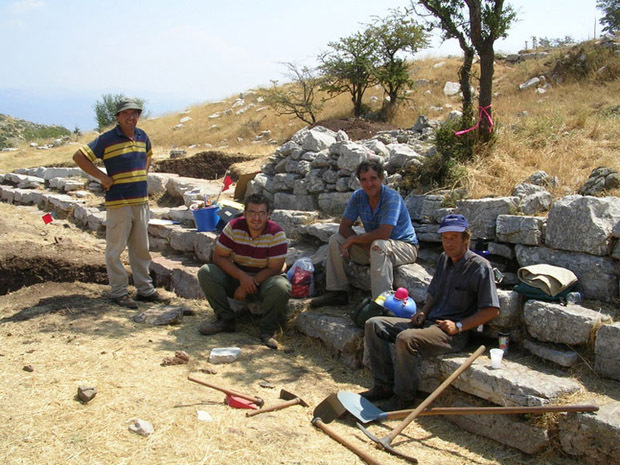 Four local workmen were hired to clear the site of brush and high grass and also served as workmen for the trenches that were dug in the lower and upper areas of the Sanctuary of Zeus. A representative of the Greek Archaeological Service, Ms. Alexandra Sarandopoulou from the 39th Ephoreia of Prehistoric and Classical Antiquities was present for the season and we thank her for her assistance and good will. 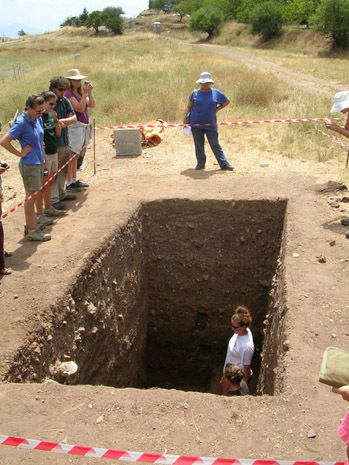 Mr. Vassilis Papadopoulos, an archaeologist from the 39th Ephoreia opened two trenches near the area of the seats in the lower sanctuary and one trench in the area of the temenos near the ash altar. Our work was divided into several parts that included geological survey, geophysical survey, topographical and architectural survey, architectural documentation, historical survey, landscape studies and excavation. Dr. George Davis of the University of Arizona and a small team continued his geological survey of the area immediately surrounding the southern peak of Mt. 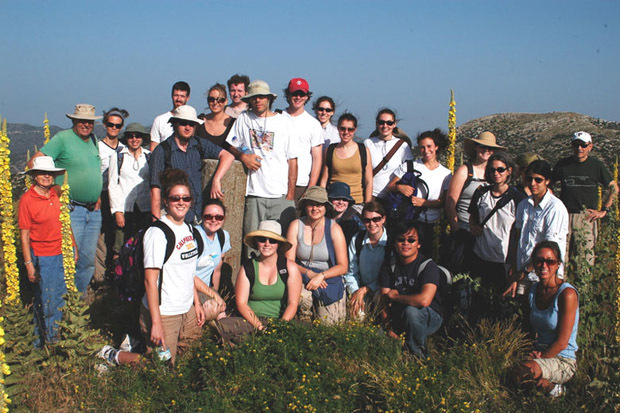 Lykaion, further defining the structural geology of the region. 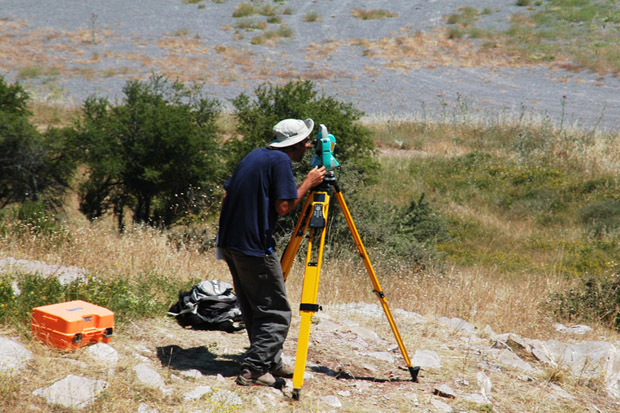 Dr. Apostolos Sarris of the Institute of Mediterranean Research at FORTH in Rethymnon, together with a team of six, undertook geophysical remote sensing in a number of areas of the site in order to assist in identifying attractive sites for study and excavation. Two topographical survey teams, using electronic total stations, continued the work of documenting the location of every above ground and visible block on the site. A team of six architecture students continued the work of documenting, by means of a series of hand drawings, every significant architectural block, working together with the topographical survey team to create the first actual-state drawing of the buildings and monuments of the sanctuary. The architects, largely supported by the Samuel H. Kress Foundation, specifically worked on documenting two different structures at the site, the ca. 40 m long series of steps or seats to the north of the stoa and the east wall of the adjacent ‘xenon‘ building. The architectural renderings of the blocks at the site now number over 2200. 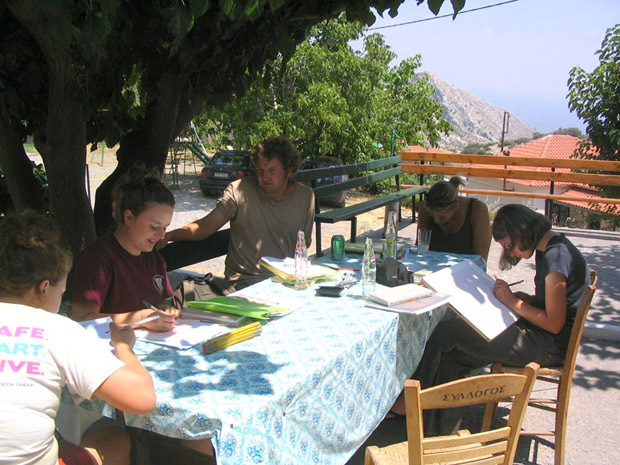 Dr. Yanis Pikoulas of the University of Thessaly, together with a group of three students, continued his historical study of the area of Mt. 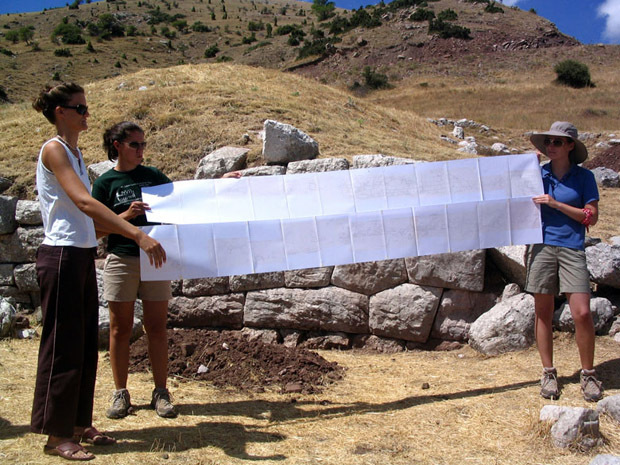 Lykaion, identifying ancient roads and towns in the region. 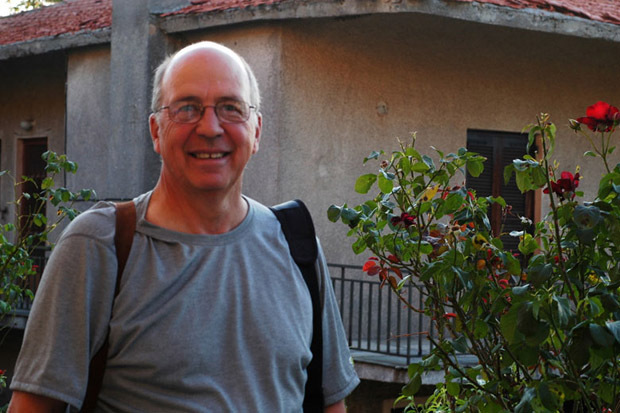 Mr. Mark Davison, of the University of Oregon, continued his cultural landscape study of the area of the Sanctuary of Zeus and the ways in which a cultural database will be presented and might be extended to include a larger area of land for the proposed national archaeological park. There continues to be good interest in the idea of the archaeological park that would protect and unify an area of nearly 300 square kilometers of land in and around Mt. Lykaion. Expropriation of land was undertaken since the summer season of 2006 and as a result we were able to excavate in the area of the altar and the temenos at the southern summit of the mountain as well as in several areas in the lower sanctuary to the south of the hippodrome. We opened trenches in six different areas of the site; at the altar of Zeus, in the temenos, in the ‘xenon,’ in the area of the seats (or steps), at the front of the stoa, in the walnut grove below the seats, and on the terrace southwest of the hippodrome. From the altar trench, Z, was recovered, what is identified in preliminary analysis, Early, Middle and Late Helladic pottery suggesting that the altar was in use from the 3rd millennium B.C. Excavating 100 years ago, Kourouniotes reported material from the altar no earlier than the 7th century B.C. The new material creates a vastly different account of the history of the altar and the site. Also found in the altar trench were pottery and objects from the Geometric, Archaic, Classical and Hellenistic periods, including bronze tripods and rings, iron blades, a spit and silver coins. Of considerable interest is what is likely to be a Late Minoan II crystal lentoid seal showing the image of a bull with full frontal face. 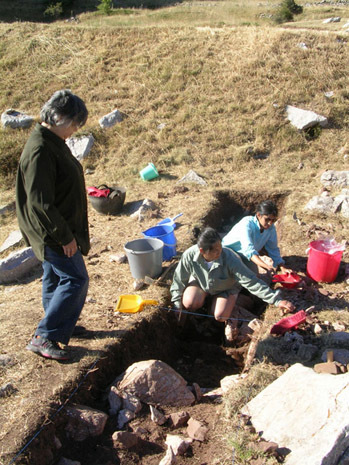 A considerable amount of bone was recovered from the altar excavation, with analysis underway, but preliminary results indicate large and small animal bones of various kinds, and no human bones. A group of trenches, T-Y, were opened in the area of the temenos, near the altar; the total area of the trenches was 52 square meters. Bedrock was found in these trenches with virtually no other finds. In the lower sanctuary a trench, H, was opened within the area of the ‘xenon’ building. A small portion of the floor of the building was cleared, and evidence for interior wall plaster was recovered from the north wall of the building. A small test trench N was dug outside the northeast corner of the ‘xenon.’ Several trenches, K, L, & M, were dug at the outside northern wall of the stoa, exposing the foundation and a portion of the interior of the building. Three trenches G, I, J, were dug in the area of the seats or steps. An exploratory trench F was dug in the area of the walnut grove to the north of the north end of the steps. Bordering the southwest side of the hippodrome, on a slightly elevated terrace (1.5 m) was dug an exploratory trench, E, which revealed ancient levels. These trenches yielded amounts of ancient pottery sherds, roof tiles, bronzes, iron as well as coins and other small finds. Ms. Teresa Moreno of the Arizona State Museum continues to be our conservator, this year supported by the Samuel H. Kress Foundation. The finds are stored in the nearby Lykosoura Museum.